When you dream, dream Big (1.). If you don’t you may never know the joy of Roaring Fork Fly Fishing in the Roaring Fork River itself. 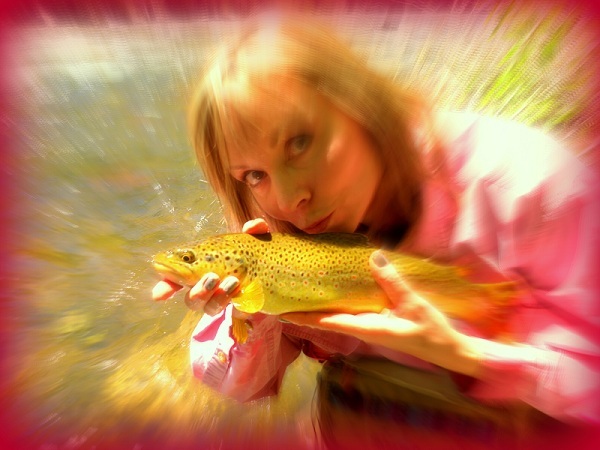 Roaring Fork fly fishing just gave me the biggest heart-thump and breath-taking gift I’ve ever had; I just caught the biggest fish of my life (sans guide) behind my house and I have to pause to give thanks to dreams realized. My story starts as a fourth generation Texan choosing to vacation every year in Colorado, as most good Texans do. Growing up proclaiming year after year that “Someday I’ll live up there in that Rocky Mountain High – mark my words”. Growing up in the flat, treeless panhandle of Texas for the first 18 years of my life only steeled my resolve. “Someday I’ll have mountain waters running outside of my home and the chipmunks and trout will be my neighbors. Someday I’ll wake and go angle a Rainbow in the Roaring Fork River or climb a peak at whim. That day was realized in June of this year. We grew up fishing for trout in the typical vacationer’s fashion; sporting our Folgers coffee can of worms and glistening jar of salmon eggs. Granddad taught me how to catch my limit in any circumstance and then he taught me how to clean it and fry it up over a camp-fire. Daddy liked to elevate any effort with style and grace so he used one of those strange rods with a reel that didn’t have a thumb-release and then in 1992 this art was depicted to me on the big screen ala Brad Pitt and “A River Runs Through It”. I devised a plan to take to the rivers with a fly rod and “catch and release” as many trout as I could and, “catch and keep” Mr. Pitt. In the year 2004 I had a date, (who held no similarity to Brad whatsoever and had no insight to my ‘catch and keep’ plan), unwittingly take me to a tail-water outside of Basalt Colorado known as, “The Frying Pan”. Up to this point I had only accomplished a few fly-fishing lessons on my own, had nearly given up hope of finding love on the river and besides, Brad rarely called. On this fateful day the sun was bright, the waters were clear, and we could see our targets holding effortlessly in the flats of crystal waters. I was instructed to tie on a big, fluffy, “dry fly” and to cast upstream and let the bug float naturally over the fish’s head. My cast splashed a bit but by the time it reached my target I couldn’t tell my artificial fly from those skidding across the waters in a mid-day hatch. My trout was as big as a football with flashes of pink and white. I saw her see my bug. I saw my bug float right past her mouth. I saw her turn and consider the take. My line went guitar-string tight and all I could hear was someone yelling, “rod tip up!”. It was a righteous fight of give and take but we got her to the net. I put my hands on her, I looked her in the eye, I kissed her on the nose, I took my time… and then I let her slip back into her azure nest to bring someone else a little taste of paradise another day. Since then I’ve invested a small fortune in gear, started a website to introduce more women to fly fishing, fished with some of the finest, most learned anglers on the planet, caught an assortment of game on a fly-rod including Bass, Carp, Mackerel, and Drum-fish, and decided that the time to start living one’s dream should be sooner than later. 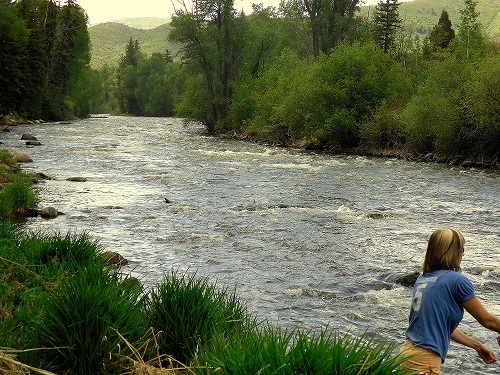 My dream started small with weekends in the valley enjoying my Roaring Fork fly fishing out of the back of my SUV; my adventure wagon and sleeping quarters… “ in a van down by the river”. I soon decided that while a shower may not be an absolute prerequisite to dining in most Aspen restaurants they did look favorably upon it and I started investing in a hotel room which quickly ate up my entire recreational budget. I considered a six month apartment lease in the heart of Basalt but when I ran the numbers I became discouraged at “throwing away” money when I could be investing. It finally occurred to me that the market was right to dream big and go for a home right smack dab on the river. Yesterday I knocked off early to go talk to a truck full of anglers I saw pull up near my drive-way to begin their approach to the Roaring Fork river. My decision resulted in a quick conversation with a local legend, Sandy Moore. He took the time to show me what he was tying on for his guests and I was even more thrilled to learn that he guided out of the Taylor Creek Fly Shop with Gifford Maytham, otherwise known as “the Golden Boy” - my friend and the first guide to show me how to enjoy Roaring Fork fly fishing. I immediately rigged up my own 5 weight, pink, Elkhorn fly rod with the suggested pattern and got two big trout to the net in a matter of a half hour; one big Brown and one Rainbow. Then I went in to my little riverside home to enjoy a cold beer, a hot shower, and thank God that I never limited my dreams to coffee-cans and vans. Tell me more about fishing "How To".